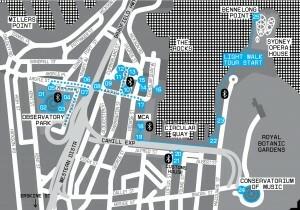 Smart Light Sydney 2009 light walk map. Smart Light Sydney was the world’s first low-energy light art festival, presented as the ‘light walk’ component of the New South Wales Government’s first Vivid: Light Music Ideas tourism promotion event, held 26 May–14 June 2009. Twenty three Australian and international artists were selected by Smart Light creator/director Mary-Anne Kyriakou to present new creative expressions using low-energy urban lighting technologies and eco-ethical strategies. These included avoiding incandescent, fluorescent and halogen lamps, ‘carbon-belching’ fireworks and bonfires, sky-polluting lasers and searchlights; instead focusing on renewable energy sources rather than fossil fuels, and exploiting the efficiencies of digital-era lights, especially colour-changing LEDs and laser-scanned and 3D mapped video projections. The main light walk attracted up to 800,000 people (on weekend evenings) to Sydney’s Circular Quay, the Rocks and Observatory Hill. —sm(ART) Light, an exhibition of light sculptures at the University of Technology, Sydney, curated by Mike Day and including artworks by Bert Bongers, Richard Dunn, Chris Henschke and Donna Kendrigen, Mary-Anne Kyriakou, Warren Langley, Tom Loveday, Ruth McDermott, Berto Pandolfo and Michael Snape. —Stockhausen Licht, a one day event at the Conservatorium of Music, celebrating the German modernist composer Karlheinz Stockhausen, featuring extracts from Licht, his seven day music-theatre cycle. —Smart Light, an exhibition of new low-energy light artworks, at Sydney Customs House. 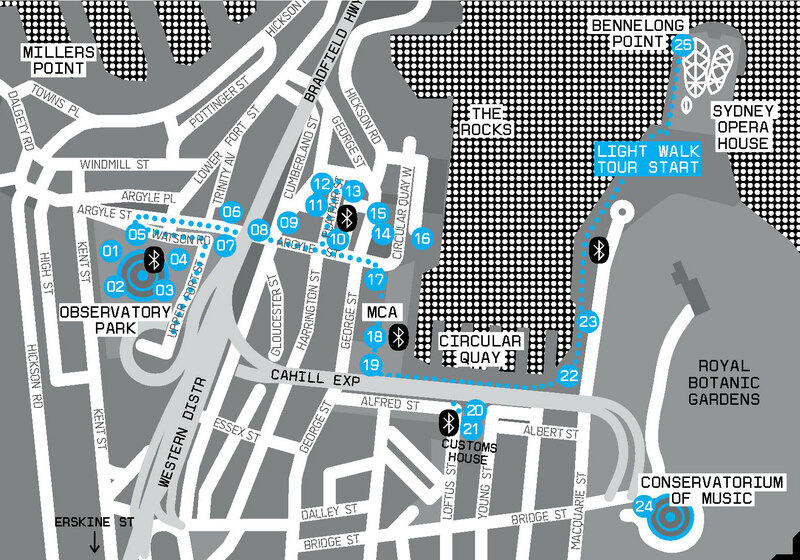 —Smart Light Fields, by Joanne Jakovich and Jason McDermott, a live screen visualisation of real-time locations of selected festival visitors carrying mobile phones around Circular Quay. —Smart Light Symposia: four seminars hosted by the University of Technology, Sydney, to debate urban light art advances and issues. Topics were Future Cities, Engaging the City, Lighting the City, Smart Architecture.